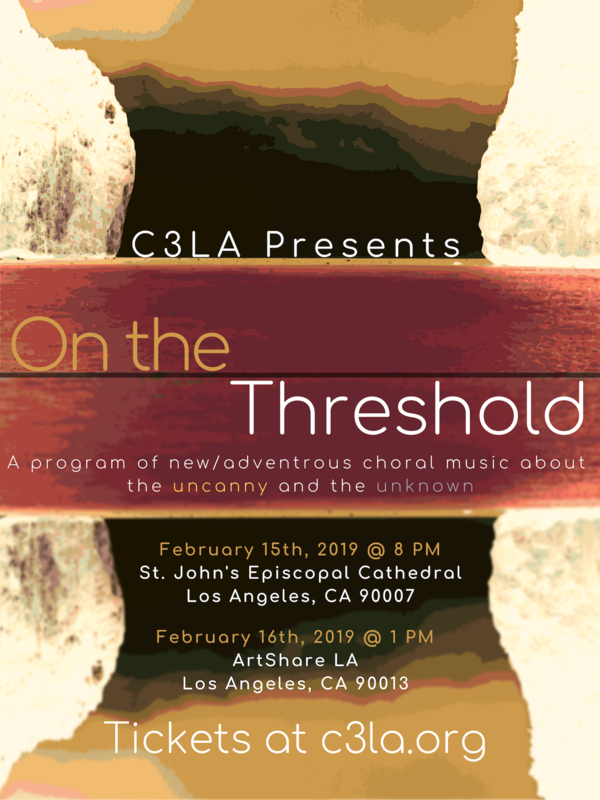 The Contemporary Choral Collective of Los Angeles (C3LA) presents their second concert series of the 2018-2019 season, ON THE THRESHOLD, a concert that features pieces about the uncanny, the unknown, and the growth that comes from not knowing the next step. This concert will feature pieces by C3LA composers Adam Goins (Banner of Youth), Alice Dryden (The Second Coming), David Rentz (Alchemy), and TJ Sclafani (oublier), as well as pieces by Michael Gordon (He Saw a Skull), Nico Muhly (I Cannot Attain Unto It), and Joby Talbot (The Wishing Tree). This concert will also feature two pieces workshopped over the summer during our Writing for the Voice Workshop: Jasper Wald Sussman’s Dog on the Meridian of the Kennedy Expressway, Chicago and Peter Walters’ He Would Not Stay for Me.